Abstract: Two pilot-scale tests of surfactant-modified zeolite (SMZ) permeable barriers were conducted at the Large Experimental Aquifer Facility of the Oregon Graduate Institute. The tests were performed in an 8.5-m-wide, 8.5-m-long, 3-m-deep concrete tank. The SMZ was installed in a 1-m-wide, 6-m-long, 2-m-deep barrier frame in the center of the tank. The rest of the tank was filled with sand to form a simulated aquifer. A three-dimensional sampling array consisting of 405 sampling points was installed in the tank. 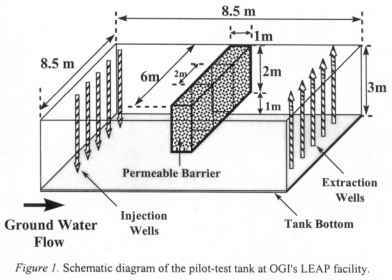 Controlled water flow across the tank was maintained using ten upgradient injection wells and ten downgradient withdrawal wells. A specific discharge of 0.17 m day-1 was imposed, resulting in an average linear groundwater velocity of approximately 0.5 m day-1 in the sand. The upgradient wells allowed injection of a three-dimensional contaminant plume composed of 10 mg L-1 (0.19 mmol L-1) Cr, in the form of chromate, and 1.8 mg L-1 (0.011 mmol L-1) perchloroethylene (PCE). In the first pilot test, 12 metric tons of 14-40 mesh (1.4-0.4 mm) SMZ, manufactured at a cost of about $460 per metric ton, was used as the barrier material. Intensive sampling showed that much of the contaminant plume was being deflected under and around the SMZ barrier. Hydraulic testing failed to conclusively isolate the cause(s) of the flow restriction but suggested that a partially plugged barrier frame, along with a possible decrease in SMZ permeability, were responsible. For the second pilot test, the 14-40 SMZ was excavated from the frame, a nylon screen on the barrier frame was removed, and two sections of the frame were refilled with 8-14 mesh (2.4-1.4 mm) SMZ. The remaining one-third of the frame was filled with iron/SMZ pellets as part of another project. After steady water flow was reestablished, chromate and PCE were injected over a period of eight weeks. No plume deflection occurred in the test with the 8-14 SMZ. The SMZ fully intercepted the contaminant plume and prevented migration of contaminants downgradient of the barrier. Near the end of the test, chromate and PCE were detected in samplers installed in the upgradient portion of the SMZ. The estimated retardation factors for chromate and PCE in the pilot test were 44 and 39, respectively. These retardation factors are very close to the values of 42 and 29 for chromate and PCE predicted from laboratory sorption isotherm experiments. 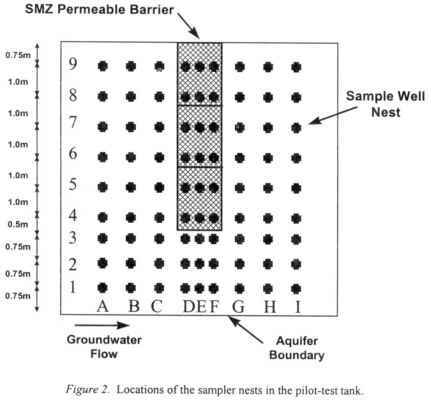 The pilot test results demonstrate that contaminant retardation by an SMZ permeable barrier can be well predicted from laboratory characterization of the SMZ. Furthermore, the engineered water control, sampling, and containment system developed for this project serves as a general model for testing permeable barrier performance. Groundwater cleanup at industrial, government, and military facilities continues to be a high priority. Waste disposal or leakage at many of these sites has resulted in contaminants that are distributed in shallow, broad areas. Many sites have contamination that is spreading and needs containment. 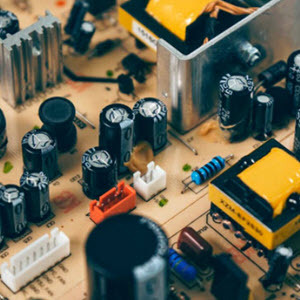 The contaminants are often complex mixtures that may include chlorinated and nonchlorinated organic compounds as well as highly oxidized metal species such as arsenate, chromate, and selenate. These metal oxyanions are mobile in most aquifers. Sorbent/reactive materials emplaced in permeable subsurface barriers are promising tools for dealing with such complex and expensive groundwater contamination problems. Barrier materials that retain organic compounds, radionuclides, and other hazardous contaminants while allowing the passage of groundwater are needed to prevent plume migration from near-surface waste sites. Such barriers will allow concentration of contaminants in a narrow zone, increasing the efficiency and lowering the costs of other in situ treatment methods such as enhanced biodegradation or air stripping. The use of surfactant-modified zeolite (SMZ) as a permeable barrier sorbent may offer several unique advantages when dealing with mixed contaminant plumes. Zeolites are hydrated aluminosilicate minerals characterized by cage-like structures, high internal and external surface areas, and high cation exchange capacities. Both natural and synthetic zeolites find use in industry as sorbents, soil amendments, ion exchangers, and molecular sieves. Clinoptilolite is the most abundant naturally occurring zeolite. It has a two-dimensional 8-ring and 10-ring channel structure with the largest cavity dimension measuring 4.4 by 7.2A (Newsam 1986). The unit-cell formula is (Ca, Na2, K2)3 [Al6Si3o072]*24H20. The low cost of natural zeolites ($45-$60 ton"')makes their use attractive in water treatment applications. Zeolite surface chemistry resembles that of smectite clays. In contrast to clays, however, natural zeolites can occur as millimeter- or greater-sized particles and are free of shrink-swell behavior. As a result, zeolites exhibit superior hydraulic characteristics and are suitable for use in filtration systems (Breck 1974) and as permeable barriers to dissolved chemical migration. Internal and external surface areas up to 800 m2 g"'have been measured. Total cation exchange capacities in natural zeolites vary from 250 to 3000 meq kg"1 (Ming and Mumpton 1989). External cation exchange capacities have been determined for a few natural zeolites and typically range from 10 to 50 percent of the total cation exchange capacity (Bowman et al. 1995). Due to their large specific surface areas and high cation exchange capacities, natural zeolites have a high affinity for cationic heavy metals such as Pb2+ and Cd2+ (Colella et al. 1995). Zeolites have been used commercially to remove Pb2+ and NH4+ from waste waters (Groffman et al. 1992; Mumpton and Fishman 1977). However, natural zeolites have little affinity for inorganic anions such as chromate (Cr042) or for dissolved nonpolar organics. Treatment of natural zeolites with cationic surfactants dramatically alters their surface chemistry. The large organic cations exchange essentially irreversibly with native cations such as Na+, K+, or Ca2+ (Bowman et al. 1995; Li et al. 1998). Surfactant modification of zeolites enables them to sorb nonpolar organics such as benzene and chlorinated hydrocarbons, including perchloroethylene (PCE) and 1,1,1-trichloroethane, while retaining their ability to sorb heavy metal cations (Li and Bowman 1998; Neel and Bowman 1992). The sorption of target organics is little affected by the presence of other nonpolar organics in aqueous solution (Neel and Bowman 1992). It has also been shown that strongly hydrolyzed, anionic metals such as arsenic, chromium, and selenium are selectively removed by SMZ (Haggerty and Bowman 1994). While sorption of target anions is reduced in the presence of competing anionic species, the SMZ is selective for sorption of multivalent oxyanions. prepared using HDTMA is stable under a wide range of pH and Eh conditions and in organic solvents and is resistant to microbial degradation (Li et al. 1998). After the SMZ is saturated with an anion or volatile organic contaminant, it can be regenerated with little loss of sorption capacity (Bowman 1996). The work described above shows that SMZ is a physically and chemically stable sorbent that can simultaneously remove organics, inorganic cations, and inorganic anions from contaminated water. Because of the broad sorptive capabilities of SMZ, its superior hydraulic characteristics, its low unit cost, and the historical use of zeolites in water treatment facilities, this material is very promising as a sorbent for in situ treatment of contaminated groundwater. The research described in this chapter is part of an effort to develop and test a zeolite-based permeable barrier system for containing and remediating contaminated groundwater. The specific goals of this work were to scale up the production of SMZ, install the SMZ in a pilot-scale permeable barrier, and compare barrier performance to predictions based on laboratory characterization of the SMZ. The pilot test was conducted at the Large Experimental Aquifer Program (LEAP) site at the Oregon Graduate Institute (OGI). The LEAP tank is an 8.5-m-wide, 8.5-m-long, 3-m-deep concrete pool. The permeable barrier was 1-m wide, 6-m long, and 2-m deep, and designed to simulate a real-world application where the barrier was not keyed in to a low-permeability layer. A schematic diagram of the pilot-test facility is shown in Figure 1. A steel liner reinforced with a steel I-beam baffle was installed in the LEAP tank for secondary containment of the experiment. The primary liner was a 0.64-cm thick welded seam high-density polyethylene (HDPE) liner installed within an outer steel liner. Baffles in the steel liner were backfilled with pea gravel and contained eight fully screened 5-cm-inner-diameter (ID) wells. These wells could be used for leak detection as well as mitigation by inducing a hydraulic gradient into the tank. The finished interior dimensions of the tank were 8.5-m wide, 8.5-m long, and 3-m deep. HDPE liner with Sika-Flex™ and a silicone-based glue. To prevent sand from flowing into the barrier when it was empty, the interior and exterior perforated metal walls of the frame were covered with 100-mesh nylon screen attached with silicone-based glue. After the barrier frame was in place, pipes for the injection/extraction wells, piezometers, and the sampling network were suspended in the tank from cables. Sand was then added in lifts to fill the remaining aquifer portion of the tank. After the aquifer material was in place the SMZ was packed into the permeable barrier frame. The pipes were buried in place as the tank and frame were filled. Ten injection and ten extraction wells were used to control water flow within the tank and to inject contaminants. The wells were bundled in pairs, with five pairs at the upgradient end of the tank and five pairs at the downgradient end. In each pair, one well controlled water flow in the lower half of the tank while the other controlled flow in the upper half. All wells were constructed of 5-cm-ID schedule 40 polyvinyl chloride (PVC) tubing. The lower wells were 3-m long and screened over the bottom 1.5 m while the upper wells were 1.5-m long and screened over the entire length. A moveable packer in the upper injection wells allowed control of the contaminant injection interval. Eight piezometers were installed to monitor water pressures within and outside the barrier. Piezometers were constructed of 1-in- (2.5-cm-) ID schedule 40 PVC of 1-m length screened over the bottom 0.17m. A3B translates to column A, row 3, depth black. The depth roughly corresponded to the color spectrum, beginning with the red (deepest), followed by yellow, green, black, and white (shallowest). Color coding the samplers and bottles increased accuracy significantly in collecting and analyzing large numbers of samples. Figure 2. Locations of the sampler nests in the pilot-test tank. 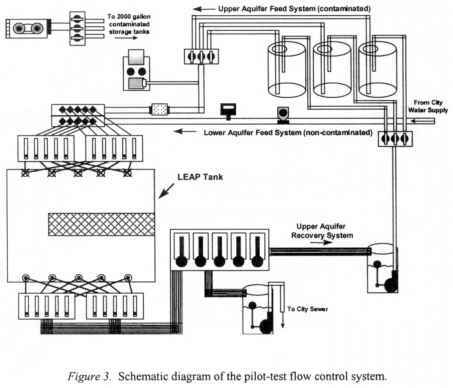 Figure 3 is a schematic diagram of the pilot-test flow control system. The flow in the pilot-test tank was stratified into upper and lower zones created by the five upper injection/extraction wells and the five lower injection/extraction wells. The feed water was dispensed through a flow totalizer into the injection wells via a manifold and a series of ten controllable flow meters. The lower injection wells were fed directly with Beaverton city water. The upper injection wells were fed from three 6800-L tanks. Using three tanks allowed one tank to be actively supplying feed water, one to be full with the appropriate input solution, and one to be receiving tank effluent. Water for the upper injection wells was supplied under gravity pressure. Water was removed from the extraction wells using five Cole-Parmer Masterflex® L/S™ Variable-Speed Standard Console 1/10 hp drives, each capable of operating four peristaltic pump heads from 1 to 100 rpm. Injection and extraction rates were controlled manually using valves. These rates, as well as the water levels in the feed tanks and pilottest tank, were monitored continuously using HPVee™ software. Redundant float switches connected to automatic cutoff valves protected against fluid escapes from the system. During pilot-test tank saturation and flushing, the feed tank contained Beaverton city water. During contaminant injection, the feed tank also contained the target input concentration of chromate. A 9:1 methanol: PCE mixture was injected into the feed line via a high-performance-liquid-chromatography (HPLC) pump to yield the appropriate PCE input concentration. The target contaminant concentrations in the injection wells were 10 mg L-1 (0.19 mmol L-1) Cr(VI) as chromate and 1.8 mg L-1 (0.011 mmol L-1 PCE. Effluent from the extraction wells was checked for chromate and PCE concentrations and discharged to the municipal sewage system if it met regulatory standards. Effluent not meeting standards was directed to a receiving tank where it was air-stripped of PCE. Chromate was then added as necessary to establish the correct input concentration. This tank was now ready to serve as a feed tank. In this manner each of the three tanks served alternately as a feed, standby, or receiving tank.